Rummy is a game that has always been a part of social circles and you will always find someone or the other play rummy with circle of friends at social events or festivals. The game has been in existence since time immemorial and even today, it enjoys a lot of following from people all over the world. As a matter of fact, it is one of the best ways to bond with circle of rummy friends and family. Junglee rummy offers you an incredible platform to invite your friends and create your very own circle of rummy and take part in various competitive tournaments held across the year. You can choose between freeroll and cash tournaments where you can win millions in cash prizes. It Pays to Create your Very Own Circle of Rummy! At Junglee Rummy, it pays to play rummy with circle of friends as we reward our patrons for sticking around and spreading the word. Which is why when you invite your friends who are a part of your circle to join you, we will give up to Rs.2000 for each friend who joins. With every new referral, you can also track your bonus and stay updated about the bonus credited to your account. The more you refer, more are the chances of winning cash. 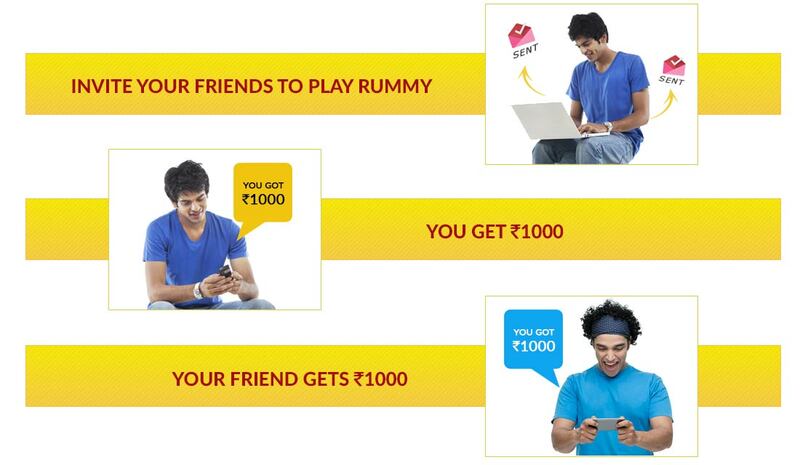 So, spread the word, invite your circle of rummy friends and win real cash. Rummy Tournaments: Tournament is probably is most competitive variation of Indian Rummy. Played for up to five rounds, players need to progress to higher stages for winning the prize pool. There are freeroll and cash tournaments where players can win free money or win bigger prize pools by paying entry fees. The players with highest number of chips proceed to higher rounds and the top players share the prize pool, according to their position held in the tournaments. Rummy tournaments are so popular that mega tournaments are frequently held online and offline with massive prize pools. Due to this widespread popularity, tournaments are available in almost every online rummy games sites.